Sweeping views, single level living, luxury construction, and a coveted address coalesce at this incredible Hope Ranch estate. Enjoy the good life in Santa Barbara’s exclusive enclave complete with a private beach, miles of equestrian trails, a newly renovated country club, and some of California’s top rated schools. Defined by pitched ceilings and staggering mountain views, the living room is warm and welcoming, and epitomizes the scale and style of the home. Lofty beamed ceilings allow the full ridgeline to be on display and a handsome stone fireplace nicely balances the power of the mountains beyond. 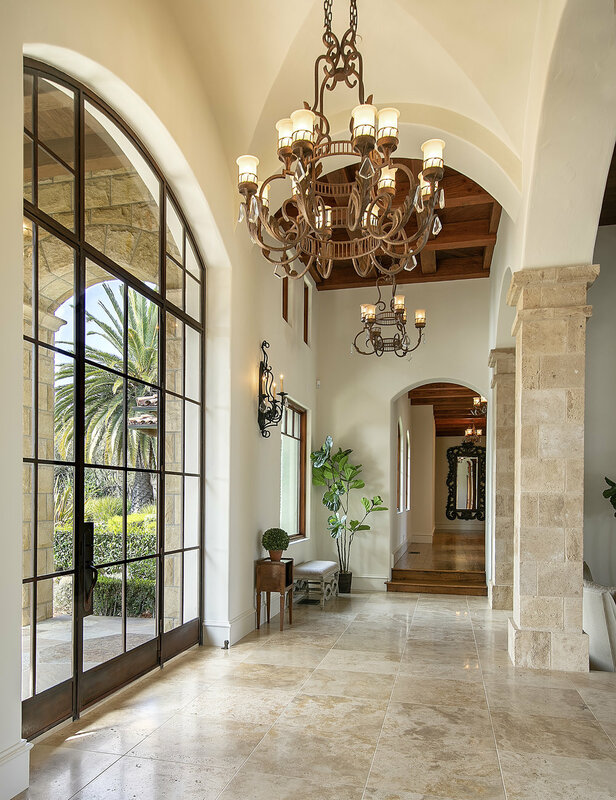 Step inside the glass and iron front door and into a gorgeous living room. At twilight, spectacular sunsets illuminate the hillside and fill the room with an incandescent glow. Multiple seating areas and a bar can accommodate serious entertaining, yet you’ll feel right at home on a cozy evening for two. The formal dining room conveniently connects to the living room, opens to the mountain view terrace, and extends to the kitchen. Intimate and inviting yet gracious and grand, the dining room is a natural entertaining space. Holiday feasts with loved ones and impromptu dinners with friends are both hosted with effortless elegance. Calling all chefs! This epicurean kitchen is anchored by a large center island with room for creation and consumption alike. Professional appliances help you shine, whether trying an ambitious new recipe, or fixing an easy weeknight dinner on the go. An oversized pantry is ideal for stocking essentials and storing tabletop decor. Extending to the dining room, breakfast nook, and adjacent family room, the kitchen is the true heart of the home. Pitched, beamed ceilings give the family room elegant proportions while a gas fireplace keeps the space cozy and casual. Built in shelves are perfect for books, bits, and bobs, and a built-in desk is ideal for staying connected. Enjoy the big game on TV or enjoy watching Mother Nature and her sweeping mountain views. The paneled office and vast mountain views are an inspiring backdrop for taking meetings, going through mail, or penning your memoirs. Steel doors open to a covered terrace and the grounds beyond. Enter the master suite and feel yourself begin to unwind. Beautiful mountain views are complemented by the suite’s stunning architecture and spaces. The vast suite features a curved wall of windows, built-in shelving, and a gas fireplace. Direct access from the master bedroom to the spa terrace means you have no excuse not to take a moonlit dip. A large walk-in closet has ample storage for all seasons and then some. The bath features a gas fireplace, dual vanities, a soaking tub, and an oversized walk-in shower. Full house for the holidays? Hosting three generations under one roof? The eastern wing of the residence is home to two gracious en-suite bedrooms, and two additional jack-and-jill bedrooms are located on the western wing. Accommodate guests and loved ones in this thoughtful and well-designed floor plan. Downstairs, a lower level bonus room is ripe for adventures of all kinds. Pool, ping-pong, and playhouses are right at home in the extensive space. Watching movies with stadium seating, surround sound, and a big screen brings a new meaning to home theater. The 2,500-bottle wine cellar can comfortably host an impressive collection. Whether you prefer collecting or consuming, oenophiles of all kinds will appreciate the cellar’s custom lit onyx counter and wall which cast a beautiful glow over the custom millwork. 4280 Via Esperanza embodies the best of Santa Barbara’s iconic indoor/outdoor lifestyle. Take your morning coffee al fresco with an eye towards the mountains. Enjoy an afternoon splash in the sun. Do you prefer the shade? Choose to keep it cool under one of the many covered verandas. The outdoor spaces are ripe for adventures of all kinds. Santa Barbara’s best-kept secret is the coveted beauty of mountain views. Ever evolving and always alive, the hillside is a 24-7-365 organic canvas. Misty summer mornings may hide the ridgeline, though the afternoon sun highlights the bevels and fissures of our beloved hiking trails. As the sun traces its lazy arc across the sky, the beauty of Santa Barbara’s southern orientation takes center stage as the mountains come alive in glowing shades and shadows of pinks and purples. When the sun has gone down, and the moon has come up, the twinkling lights of the American Riviera sparkle in the distance. Rarely does a home of this caliber with these attributes become available to the market. Join the fabled few who call Hope Ranch home and enjoy the best that Santa Barbara has to offer!